A mix of popular children's songs and original songs by James Humphrey, Saturday was produced and mastered at Engine Room Audio, New York City. Visit iTunes for downloads, or click "Add to Cart" above to order the CD online or at music class ($15; Series holders $10). 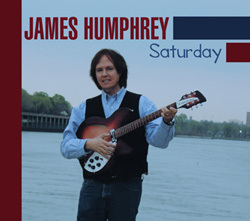 The new James Humphrey CD is Finally Here! Three acclaimed musicians join James Humphrey to create Saturday, the first Music with James CD! appears on legendary albums by John Lennon, Paul McCartney, Bob Dylan, James Taylor, Paul Simon and many more. is a Broadway musician whose numerous credits include How to Succeed in Business Without Really Trying, La Cage Aux Folles and Disney's The Little Mermaid.